The holidays are upon us once again! We hope you enjoy good times and good food with your family and friends. On Friday after Thanksgiving, we will #OptOutside, and Cosmic Bikes will be closed. We hope you too have a chance to get out in the fresh, crisp air, and work off the turkey and stuffing on your bike, or on foot. Take the time out. You won’t miss the shopping or the crowds, or the internet. An all day Open House staring at 9am with breakfast and coffee. Ad we don’t mean cereal and muffins, but real home-made hardy breakfast stuff. Throughout the day, we’ll have kids’ crafts, free demos and clinics, FREE goody bags to first 25 guests, movie night (pssst…. with beer from Temperance), and even a raffle to WIN A BIKE and other prizes, including an ever-popular SAFETY PIZZA!! You do not want to miss this. Click here for more details and schedule. If you work from home, or can sneak in late to work from time to time, come on out for a brisk, shortish ride (no more than about 30 minutes one way) with breakfast at genuine diner location. To keep things moving quickly, we'll meet at a convenient spot, and visit a different diner each week (details here). The 2-part WHEEL BUILDING CLASS is excellent for those who want to hone their skills in the fine art of wheel lacing, and end up with a road-worthy, durable hand-built wheel. To participate in this session, you must register by Tuesday, November 27, but if you register online by Friday, Nov. 23, you can save $20 with discount code BIKE101. If you’re planing to ride your bike this winter, don’t miss Frozen Chosen, our season-long service program for wintertime bike commuters. Or, Tune & Store your bike securely with us all the way through April. Details here. We’re taking advantage of the extra space we have in the winter (fewer bikes on the floor) to set up a customer lounge. We’ll have comfy seating, bike-related literature and complimentary hot chocolate & tea (ok, maybe occasional treats, too). 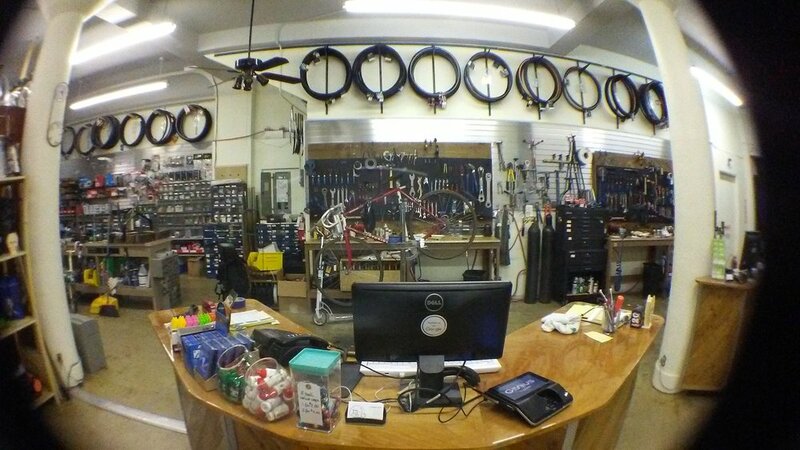 Come hang out while we complete your while-you-wait repair, or if you want to talk about a custom set-up or a new bike. Watch for a selection of unique gift items too. Many of you have asked us for Cosmic t-shirts, mugs, and other goodies, and they are coming. Stay tuned. And last, but not least, as we kick off the holiday shopping season this weekend, don’t forget to support the real, non-virtual businesses in your neighborhood. Lighted store windows and occupied storefronts make a richer, more vibrant community, and we all want to see that happen, but we depend on you. Growing a healthy local economy is a lot like cultivating a garden. A midwestern garden will not give you a tomato in January. But the tomato it gives you in August will make you question why you would buy a tomato in a supermarket at any time of the year. A neglected garden may bear some crops, but a well tended garden will reward you with real bounty. Yes, there is a cost. Even with the best care, you and your garden will sometimes be at the mercy of forces you cannot fully control: weather, insects, some problem in the soil. If you depend on your garden, your garden depends on you, and this mutual dependence means that more may be required of you in times of hardship. Putting faith, strength and financial health back into our communities means we have to overhaul our views about what it means to live in today's economy. Supporting small business, creating human-scale neighborhoods in which we can all carve out a livelihood that includes not only a living wage, but the time and leisure to enjoy the fruits of our labors, will take more than slogans and more than an annual day during which we pay homage to the ma's and pa's who've put all their stock into the corner store. It may take a little effort, but how about this for the payoff: we’ll get to know each other. You'll get a cup of freshly brewed coffee, served by a person who knows just how you like it. Bread that was baked with character this very morning. Aisles of books that smell like books and have prices discreetly penciled on the inside of the back cover, rung up by a live person, who’ll make a real heartfelt recommendation for something else you might enjoy. The store clerk who greets you by your first name, and has a funky rack of vintage clothes that have outlived their usefulness for someone, but are just the thing you need to liven up your wardrobe. The mechanic who understands that your bicycle is more than a collection of moving parts, but a magical vehicle that fulfills your dreams of independent travel. All these people who care whether you come in or not. Who take pride in their workmanship, or the service they provide. Who help create the culture of the community. People who believe that how well they do their job will affect how well your day goes. This Thanksgiving, we are thankful that Cosmic Bikes has found a welcoming home in the Jefferson Park community. We are grateful for our staff who work with us every day, some of whom we’ve had the honor of working with for as long as a decade or two now. We are grateful for the trust and loyalty that you, our customers, bestowed in us. We appreciate not only your business, but also your stories and advice, and you continue to be our main source of inspiration.